I’ll be honest: By no means am I a techie person. But for the most part, I at least know what’s going on. I use my smart phone for almost everything — on-the-fly photographs, alarm clock, calculator, flashlight, entertainment, and yes, actual phone calls. However, there’s one thing I can’t bear to move over to an e-form, and that’s my calendar. No matter how hard I’ve tried, I can’t stand looking at my phone to plan my life. Just like my house, which is often scattered with toys and the errant socks my Superhero tossed under the coffee table, my calendar can get messy. When something changes, I scratch it out. 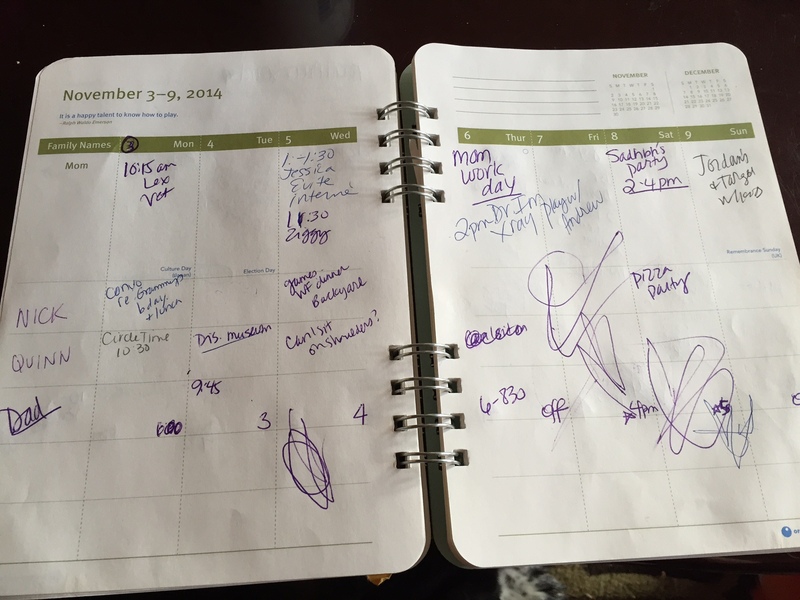 My daughter sees my calendar and a pen and uses it for scribbling practice. My son scrawls in the days he wants to buy school lunch. Belgium waffle sticks — always a kid-pleaser. This kind of disorder would never happen if I used Google calendar, or any of the other thousand scheduling apps that are surely available. But there’s something about using real paper in a book. I like having it laid out before me in my own handwriting, using one of my favorite pens. Since I do freelance work and juggle kid schedules and volunteer, no two days are ever the same. It’s both awesome and incredibly hard to manage. I love being able to survey the week. When my husband works; when Sweet Pea has gymnastics or a play date or story time at the library; when the Superhero has soccer practice or his Scholastic book orders are due for school. And oh my God, have I given my dear, blind dog her doses of eye drops today? Sometimes, I use the calendar to jot down funny things the kids say, or things I want to remember about that day. I felt cheesy buying a “mom calendar” at first. But as it turns out, I enjoy reading the sweet and funny quotes about children and parenting that are included in my calendar. The little stickers to note winter break, sleepovers and parent-teacher conferences? So cute. Plus, that’s probably as close to scrapbooking as I’ll ever get because, honestly, who the hell has time for that? My 22-year-old self would totally ridicule me for this. I don’t think anything will make me move over to electronic calendar. If that means having a disheveled book, so be it. Because that thing is filled to the brim with life and love. Flipping through its pages are like a succinct diary. It’s a reminder that time does fly — but man, we have fun doing it every day, don’t we? I don’t think I could ever feel that way about looking at a sterile computerized calendar. Am I alone? Is there anything you’re old school about? Me too!! I have a magnetic calender which sticks to the fridge. I use white board crayons and set up the months plans going through the papers of reminders I’ve stuffed underneath. There is nothing like having a tangible calender!!!! My kids are also fans of breaky for lunch in school too. 😉 If you don’t mind me asking, where do you freelance? How did you get into that? Ha! So glad I’m not the only one. People sometimes look at me all crazy when my whole world isn’t at my fingertips. 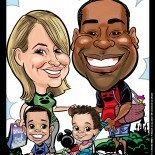 As for the freelance, I was a newspaper reporter for many years before deciding to stay home with my kids. So I had a lot of connections through past editors and coworkers. I write for a weekly shopping publication, a few websites, and periodically for USA Today’s Weekend magazines (stories coming there on Dec. 7 and Dec. 14), and some of USA Today’s specialty magazines which comes out at various times during the year. Besides the fact that I just like my paper calendar, I have a fear that my kids will only remember me as being hunched over my smart phone like some kind of de-volving humanoid creature. I already use my phone for so many other tools. I need to set it down and walk away. The calendar is totally staying on the wall. This is such a relief! And I agree, the phone is already such a go-to for so many other things. I keep an old-school address book too. I feel the same way!! I just write everything onto our calendar that hangs on the wall. 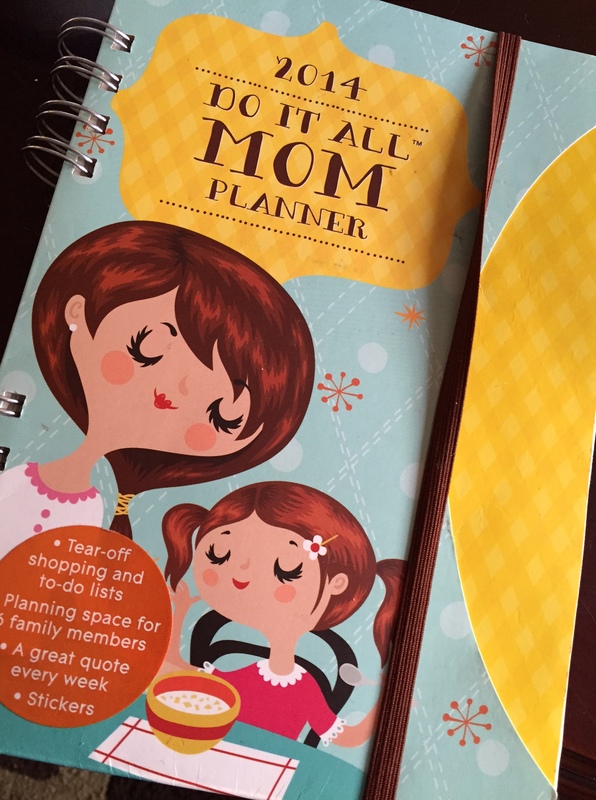 I hadn’t heard of those mom planners, but now I kind of want one! This entry was posted on November 24, 2014 by Maisy Fernandez in Random Thoughts and tagged calendar, calendar book, children, kids, planning, schedules, technology.